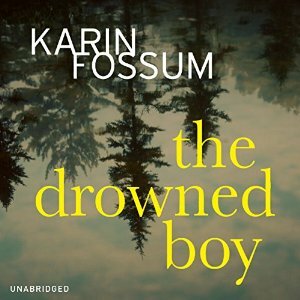 I’m slowly realising that Karin Fossum has sneakily become one of my very favourite authors. For though her books are not showy and do not set, or even follow, trends in the genre each one of the half-dozen I have read has been utterly captivating. THE DROWNED BOY is no exception. Fossum does not concern herself with the die hard criminals or serial killers so beloved of many crime writers. Instead she explores what happens when basically good people are tempted, or forced, by some circumstance or other, to do something…not so good. THE DROWNED BOY opens when Tommy, a 16-month old with Down syndrome, is found drowned in the pond on his family property. His parents, Carmen and Nicolai, are distraught. Police, in the form of Inspectors Sejer and Skarre, at first treat the death as a tragic accident. But little details make them wonder if perhaps something more sinister might have taken place. If you plan to read this book and don’t want to know any more than this brief plot summary then I advise you avoid the book’s publicity material which gives away much more. Fortunately I didn’t look at any of that material before embarking on the book and so was able to learn its secrets in the order and manner the author intended. That’s definitely a plus with a book like this which is not replete with plot twists and turns. I don’t mean nothing happens, rather that the book has a kind of realism to it in which events take time to unfold and people’s lives have moments of drama amidst the humdrum rather than being jammed full of Dramatic Elements. For me this slow burn is more satisfying, ensuring that when important developments do happen their full impact is felt and understood. In a lesser author’s hands such a simple story would have the potential to present as dull but Fossum is a master at exploring the inner psychology of her characters and making the reader completely invested in learning everything there is to know about them. She unpicks how Tommy’s young parents – barely more than children themselves – dealt very differently both with their son’s condition and then his death. The subject of Tommy’s condition, and how various other characters including Tommy’s grandparents, might have handled having a child with Down syndrome, is explored in some depth, ensuring that the reader does not dismiss the confronting element of that subject or rush to judgement about any character’s guilt or innocence. I liked that even as things become clearer about who might have played a role in Tommy’s death Fossum makes it difficult to hate the one responsible. A situation in which a good person ‘goes bad’ is infinitely more complex – and interesting – than one in which some madman is making suits out of human skin or whatever it is fictional serial killers are up to these days. As always Sejer takes time to build his case, working through all the possibilities, looking for evidence to support his theories. I always enjoy seeing his methodical approach in action, especially when it is contrasted by the way he addresses personal issues. Here he is concerned about his own health but is happy enough to put his worries on the back burner and concentrate on his work. Perhaps due to the subject matter of this story he and Skarre, who is openly religious, discuss God and faith in a way I don’t remember from earlier novels. I like the way Fossum weaves this into the main story, leaving the question of whether or not there is a God and what role s/he may or may not have played in the life of Tommy completely unresolved. I finished THE DROWNED BOY in a couple of sittings, ably assisted by David Rintoul’s excellent narration of the audio book, and recommend it to anyone interested in books which explore what particular circumstances might make a good person do something rotten and how that might present to the world. This entry was posted in book review, Karin Fossum, Norway. Bookmark the permalink. Yet another Fossum fan here . . .
Me too a Fossum fan. Real, complex people and situations. This review really inspires me to try and read the rest of the Petrona shortlist (Fossum included) before the prize is announced. Sounds fantastic. This series sounds terrific, right up my alley. I think i’ll start with the first book, In The Darkness aka Eva’s Eye. Thanks for a great review Bernadette! I don’t even know which is the first book of this series anymore…it’s one of those that has been published in English in an almost random order…nothing at all like the order of the original language publications…but somehow it doesn’t matter…they’re all good.